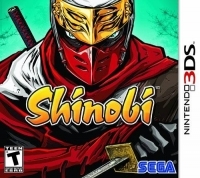 Betrayed by your friend, you must battle an ancient and evil clan in this epic continuation of the acclaimed Shinboi™ series. Perfect your ninja skills in unlockable challenge maps and retro StreetPass™ mode. 05-07-2017 dankzappa Box Text The Legendary Ninja Warrior Returns Betrayed by your friend, you must battle an ancient and evil clan in this epic continuation of the acclaimed Shinboi™ series. Intense ninja combat and magic Over the top boss encounters Perfect your ninja skills in unlockable challenge maps and retro StreetPass™ mode. This is a list of VGCollect users who have Shinobi in their Collection. This is a list of VGCollect users who have Shinobi in their Sell List. This is a list of VGCollect users who have Shinobi in their Wish List.